The property of proof is overrated. The only department to which the human race has ascribed the capacity to prove things is science. If it is not proved by science, it is commonly considered to be untrue of disputable at best. Science due to humankind's limited abilities to perceive and interpret is based on assumptions (hypotheses) that no one in the world can prove is true. Secondly, when scientists run into areas that screw up their theories, they simply add more assumptions to make theories hold up, after they have stopped panicking. The disturbing discoveries are swept under the rug and they all agree never to mention the unsettling finds again, so that their self-proclaimed position of authority in the realm of the general public, their funders and associated misinformed entities remains unaffected. The (in)famous human conjuring of Renormalization, Dark Matter and Einstein's Field Theories that can not deal with quantum gravity are just a few of the hallucinations that should make every being with more than two properly functioning braincells suspicious towards the class of mainstream science. Those cluttering up this planet who actually have more than two adequately serving braincells who dare questioning established theories are banned from the scientific plane, cut off from funds and sometimes even shot through the head to make sure they do not confute mirages that are wrapped in complex calculation and inexplicable jargon of which even smart people not belonging to the scholar world understand nothing whatsoever. If there is no prefix to your name that indicates you have spent years to comply seamlessly with the inventions of the top guns of the official intellectual circles (circus), then whatever you say that is related to the scientific delusions, is discarded off hand. You are not one of them, you are not smart enough buy whatever crap they are selling. Personally, the conduct of mainstream science weakens my sphincters, to express myself in correct terms. Proof has never proven to be proving anything at all. It is the proverbial wheel within a wheel that was spawned by factions that created hierarchical structures in order to allow themselves to have privileges thereby depriving everyone else from whatever is considered to be of value. Cliches like 'everyone is equal' and 'everyone has the same rights' are continuously proving themselves to be disturbingly hilarious and untrue. I for one am pleased to feel that I am unique, not like or equal to anyone else in this dimension. Therefore it also pleases me that I have an opinion that does not quite comply with (induced) general consensus. If you think science is not exactly interested in pursuing the truth, then don't even consider exploring the workings of official, organized religion...Religion by nature never provides proof; it simply demands you to believe what it claims to represent and stand for. It is extremely difficult to find any construction worse than that, even on this abomination ridden planet. If anything, religions have proven to cause disagreement, violence, corruption, decadence, perversity and profound deceit. All I want to do in this blog entry is to prove that proof means nothing. I don't feel the urge to prove that; proof itself proves time and again that it proves nothing. It only allows me to feel free to think anything I like at any time in any place. I would like people to share this freedom that is a birthright, inherent to your being. A universal prerogative extended to you long before you came into this realm and intended to be yours long after you leave this physical plane. Anything a sincere compassionate being feels or anything a ruthless criminal feels, is equally necessary in this space and time, just because it is possible. Human civil law only serves to maintain the corrupt hierarchical structure to which all humans are submitted (forced to submit). The underlying Maritime Law that the powers that be prefer to hide from the general public, is one step closer to the universal truth, but also not proven in any instant and place. Yet it is the implicit legal structure on which the human sense of what is right and what is wrong is based. It is explained in meticulous detail in Manly P. Hall's magnificent work that is called 'The Secret Teachings of All Ages' that you can download and study by clicking this link. By the way, the copyright of Hall's document was not extended, so downloading and having the document in your possession and studying is not illegal. Not even in the frame of corrupted civil law. The purpose of me mentioning Maritime Law it is the business of the legal trade - lawyers, judges and courts - to prove a person, company or organization of any kind guilty or not guilty of a legal charge submitted by the plaintiff. If you study the above document and watch the video clips on Admiralty Law, then ask yourself: What is it exactly that they prove? Are the various courts entitled to judge based on civil law? And what are the roles of those gathered in court for a particular case? Now prove to me that proof has any value. Whatsoever. Have a nice day! The mind in current human perception is described as follows: 'That which is responsible for one's thoughts and feelings; the seat of the faculty of reason.' Other qualities assumed to be properties of the mind are 'Recall or remembrance', 'An opinion formed by judging something' and 'Knowledge and intellectual ability' That is basically what the human mind is capable of expressing concerning the human mind. It is in no way mind blowing although most of us has had instances in his or her life in which their mind was boggled to a level beyond the power of words to express. Cultures are as advanced as their language is. Anything we experience we attempt to put to words, try to describe. Even if things are not written down or otherwise recorded, our language determines the accuracy of the account that we record. At least that is the theory. It becomes more difficult to describe an event, though or feeling when words fail to describe the experience in a way that does justice to whatever we experienced. The possibility to express ourselves in language, images, sounds or shapes etc. has its limitations. Consider this. The frames of reference that we were given, is given to us by religion, education, science etc. The food we eat, water (or other beverages) we drink, are also grown, purified or produced by others. Even the air we breathe, has been affected by so many affecting substances, entities or objects that we can never know what is in it. What is in the things we were taught, our nourishment and medication? Basically everyone is clueless about these matters. In addition, certain substances are declared illegal and / or hazardous, which resulted in most law abiding people being uninformed about the effect they have on our body and mind. Most of the time authorities determine what is good for us, what is necessary and what is forbidden. There is very little room for any of us to make our own choices, do our own experiments and find out own way through space and time. But one only has to look at the current state of this planet and all life on it to be able to say that there is something very wrong with that way authorities are going about their responsibilities. If this does not ring a bell in your head, stop reading here and go do something else. If it does, continue to read. 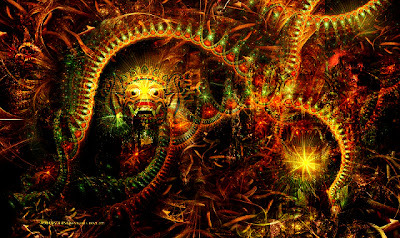 There is a book titled "The Cosmic Serpent", subtitled 'DNA and the origins of knowledge' written by Jeremy Narby and there is a video presentation held by Terence McKenna called 'Evolving Times' That elaborate from distinguished points of view on the matters that I would like to elaborate on in this blog entry. That matter is removing the boundaries that limit your mind. To people conditioned by common western perception the contents of both the book and the video may seem radical, but you might ask yourself why you consider it to be so. Is it because you have come to that conclusion by your personal thinking process or is it radical because general opinion (fully controlled by mainstream media) has told you it is radical? "You know, brother Jeremy, to understand what interests you, you must drink ayahuasca." "Some say it is occult, which is true, but it is not evil. In truth, ayahuasca is the television of the forest. You can see images and learn things." In his video presentation McKenna says something similar when asked if AI (artificial intelligence) has a future, whereby the person who asked the question probably meant to say that it might become a threat to humans if computers became too smart (for us). McKenna answered that the mushroom told him that computers are computers and that they would develop their own type of intelligence and that humans would evolve into their specific kind of intelligence. The common denominator in these two events is the psychedelic substance (psilocybin) that has the tendency to remove limitations from our perception and what is more it is able to provide concrete information that is not bound to one particular space and time. It was able to show the Peruvians how to establish and work their gardens and explained to McKenna what would take place in the future concerning the development of AI in relation to humankind. In other words: the blurring of boundaries of perception, allowing the mind to go beyond the limits induced by all (allowed, legal) sources of knowledge of society, gave information that was inaccessible without the use of the psychedelic chemicals and it gave visions of the future. Now imagine that each human being would have these capacities all the time and everywhere. Would you think the current hierarchy of this world and its power structures could be maintained? If you would conclude that this would not be the case, could it perhaps be the reason why certain plants and substances are intentionally declared illegal? In other words: If you were in a position of power in this world and able to control such matters, enjoying all privileges you can imagine and never having to worry about anything but to stay in power so you can continue to enjoy your privileges, would you not forbid the use of these substances to remain in power? Have a nice day thinking for yourself about these matters.